This camping trip I wanted an easy, minimal preparation camping menu. Some Camping trips, my prep time takes about 4 hours. I like prepping to aid in the ease of meals but this week, I needed easy. Our food was amazing, and I will repeat these meals again and again. The first night we had good old steak and potatoes. I salt my steaks with sea salt and wrap them in a paper towel. You then leave them open to air, wrapped in the paper towel for 3 to 4 days in the fridge to dry age them. You don’t have to do this but after you do this once, its hard not to. Try it, I promise you’ll notice the difference. 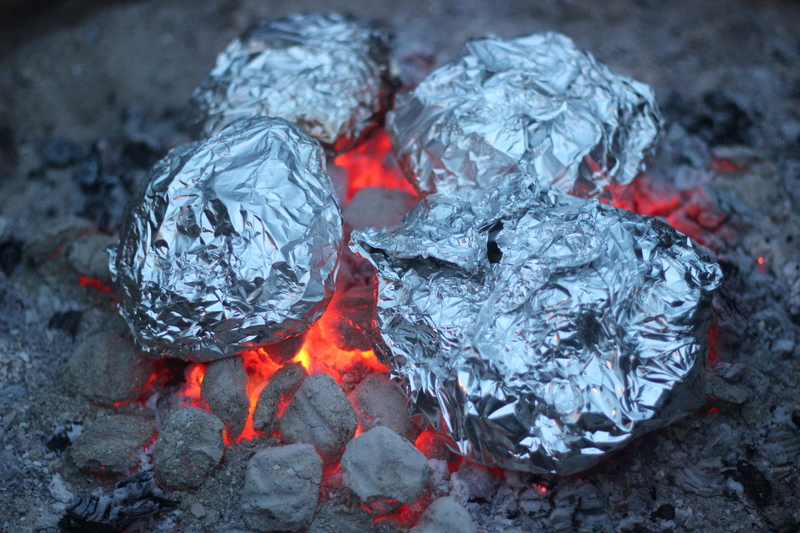 I prepped the potatoes wrapped in foil so we could start heating those up right away once we got our fire started. We added some fun toppings for our potatoes including cheese, bacon bits, sour cream, and ranch. Fun for the kids and tasty for mom, dad, Grammy and Papa. In the morning, we just had some cold cereal, yogurt, and bananas then headed out to town to visit the local farmers market. Which was amazing and always inspiring. We grabbed lunch at a local restaurant that serves fresh fish from Lake Huron. Dinner we did Hobo Packs. This is a classic, we had not had yet this year, but is one my husbands favorites from camping when he was a kid. Our kids love it too! I prepped the carrots, mushrooms and potatoes for this dish. The whole recipe is included the recipe below. For Breakfast the second day we made egg muffins, we use a griddle and toast muffins top with american cheese, Canadian bacon, and fry up a dippy egg and voila. Lunch we had sandwiches, chips and watermelon, while we were out adventuring. We made it back to start the fire and cook our Brats, hot dogs and mac and cheese. We also packed s’mores stuff, always my families favorite, and homemade chips and salsa but you could mix and match this menu to your liking. I just really liked how easy this one was. enclosed contents in foil sealing ends together, and add a double layer of foil.